Recent data indicates there is water beneath the moon’s surface. Can this water on the moon be harvested to support life or to help fuel rockets on interplanetary missions? In order to address these questions, NASA created the Regolith and Environment Science & Oxygen and Lunar Volatile Extraction (RESOLVE). 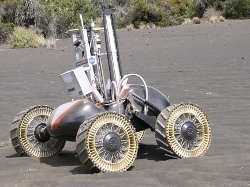 RESOLVE is a miniature drilling and chemistry laboratory about the size of an extra-large suitcase, packaged onto a medium sized rover. This device can essentially extract water and oxygen from moon dust. RESOLVE’s mission is to search for water below the moon’s surface. According to NASA SPACEPORT News (November 2011), “contained in RESOLVE are a gas chromatograph and mass spectrometer, which together will separate and analyze gasses. The fluid system will take the water (from a gas) and make a water droplet by condensing the water on a cold plate. The water droplet will be photographed and the image sent back to the Earth for all to see”. A rover will contain a miniature chemistry plant, drilling samples, analyzing components, and sending that information back to Earth. Enter Twin Oaks Computing, Inc. and their CoreDX DDS software. This small footprint communications middleware produces low overhead, flexibility, content filters, and support for time based filtering. Twin Oaks Computing, Inc. was easily able to port their CoreDX DDS software for NASA’s specialized device hardware and provide NASA the communications solutions they needed for their RESOLVE system. For this project, NASA needs a flexible, easy to port, Ethernet link: a way to “talk” with the system. Core DX DDS technology provides the solution: expediting communication between multiple nodes in equipment involved in processes such as command and control, distributed data processing, telemetry, status, and much more. All of this is done between a ground control interface, located in Hawaii, at Johnson Space Center as well as at Kennedy Space Center and possibly Canada. Working with NASA for the first time, Twin Oaks Computing, Inc. provided the middleware NASA needed to facilitate communications within RESOLVE. Currently the RESOLVE team is continuing development of the payload, preparing for a possible lunar voyage in early 2015. Twin Oaks Computing, Inc. is looking forward to continuing their collaboration with NASA, advancing space exploration and communications technologies to the moon and beyond. Twin Oaks Computing, Inc. is a company dedicated to developing and delivering quality software solutions. We build the software that collects, manages, and distributes information in a wide range of industries. Our software is in use around the world supporting critical missions. Super-small and blazingly fast, our flagship product, CoreDX DDS is the leading Publish-Subscribe Data Distribution Service middleware available for small-footprint and embedded systems. Twin Oaks, Twin Oaks Computing, CoreDX DDS are all registered trademarks or trademarks of Twin Oaks Computing, Inc. All other trademarks are property of their respective companies.